Helcim Commerce lets you modify the discount codes available to your customers at checkout and adjust specifically how they can be used. Select the Online Store tab and select Discount Codes. Click on the New Discount Code button in the top right corner. Enabled – by selecting YES, the discount code becomes active and your customers can use it. If you would like to disable the code select NO. Expiry Date – if you’d like, select the date the code will expire. If you would like to keep the discount code active at all times (such as for free shipping), do not input an expiry date. Name – enter the name of your discount code. Code – enter the code your customer will have to input at the time of checkout to activate the discount. Type – here you can select between percentage discounts, amount discounts, and free shipping. Amount - enter the amount of the discount in $ or % depending on what you selected in f.
Minimum Order – enter the minimum order amount in order to use the code. For example, orders over $20 get 15% off. If you have no minimum order amount, leave this field at 0.00. Limit To – using the drop down select if you want to limit this discount code to a specific customer, brand, product etc. For example, you can limit the discount to a specific category such as "Men's Shirts" only. 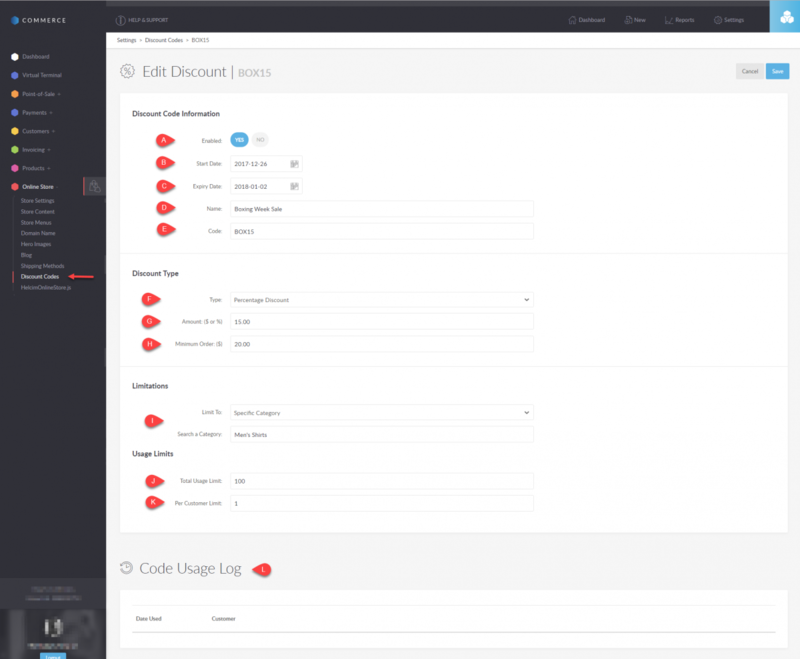 Total Usage Limit – enter the amount of times the discount code can be used. For example, if you only want the first 100 customers to get the discount, enter 100 here. Per Customer Limit – enter how many times a specific customer can re-use the discount code. In the example above, a discount called "Boxing Week Sale" with the code BOX15 is available to the first 100 customers between December 26, 2018 and January 02, 2018. It provides a 15% discount on the category "Men's Shirts" when the customer spends more than $20. It can only be used once by the same customer.